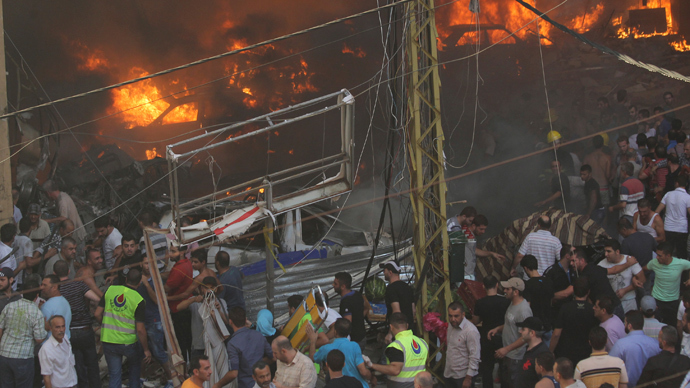 At least five people were killed and dozens injured in a powerful explosion, which shook a suburb in south Beirut housing a stronghold of the Shiite group Hezbollah. 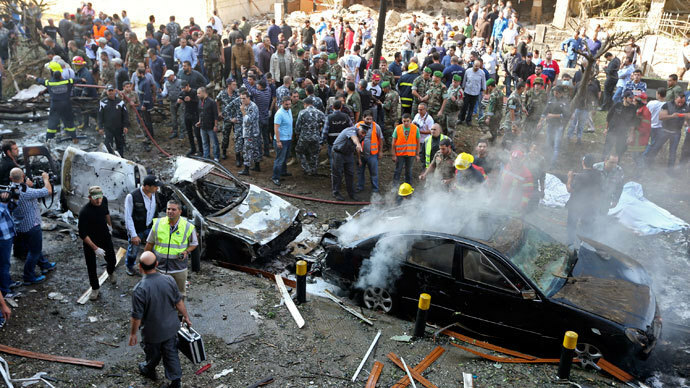 According to Lebanese Health Minister Ali Hassan Khalil, five people were killed and 66 were wounded in Thursday’s blast. The large explosion was caused by a car bomb, a security source told Reuters. Footage from the scene of the explosion showed twisted and burnt remains of several cars, with firemen dousing them with hoses. Some of the nearby blocks of flats also had parts of the facades torn off by the blast. 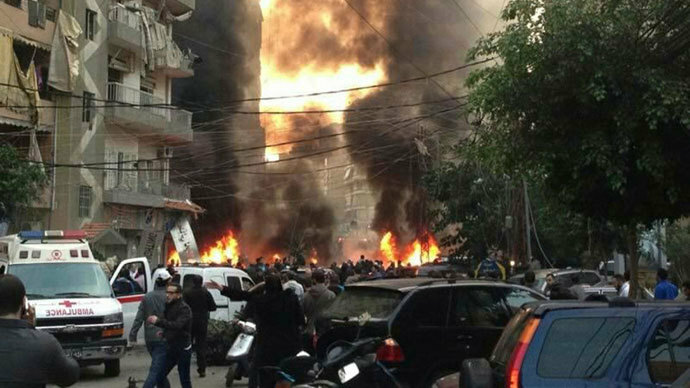 The blast targeted Beirut’s busy commercial district, causing many people to flee the area in panic for fear of further explosions. The district is also known for housing the offices of Hezbollah and its television studios, Al-Manar, which are just 200 meters away from the blast. A statement distributed by Hezbollah said no Shiite politicians or MPs were injured in the blast. Hezbollah’s Al-Manar television aired footage of the aftermath of the blast, calling it a “terrorist explosion” but saying that the group’s political bureau was not thought to have been the target. The explosion, caused by a car bomb, went off in a crowded street, said Adnan Ghalmoush, an Al Arabiya correspondent in Beirut. Security forces opened fire into the air to keep people away from the scene of the blast, he said. The bomb was placed in a four-wheel-drive vehicle, according to Al-Manar satellite TV station. Security forces in Beirut have recently defused several car bombs in the area but did not make this known to the public so as not to spread fear among residents, Ghalmoush said. The Lebanon National news agency is reporting that the National Authority for Disaster Management has called an emergency meeting in Beirut’s Grand Serail, the prime minister’s office, as a result of the bombing. 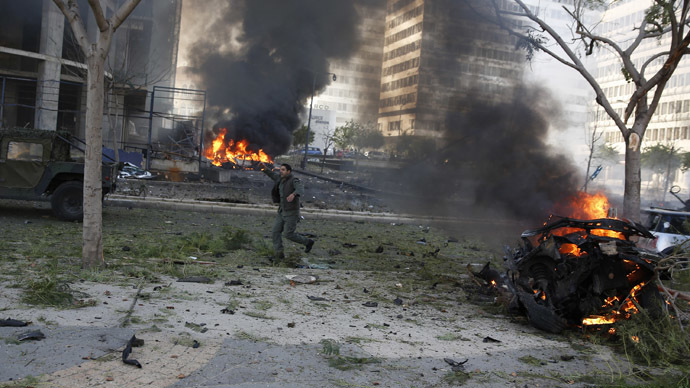 The Lebanese capital has been hit by a series of bombs in recent months. Thursday’s blast comes just days after an explosion that killed Mohammed Shattah, a government minister and a vocal critic of Hezbollah, along with six others. Sources have told the NOW Lebanon-based news website that, Hezbollah’s deputy chief Naim Qassem’s residence was near the site of the explosion.